Your 2015 Phillies wrapped up in Clearwater on Thursday with a 10-1 loss to the Rays. Now, they're back home for a pair of games against the Pirates before they start to count on Monday. For the third year in a row, the Phillies were under .500, finishing their spring slate with a 12-17 record. But, as I'm sure you know, their record in the Grapefruit League has little correlation to how the regular season will pan out. That doesn't mean, however, everything that happened so far this preseason should immediately be wiped from your memory. There are plenty of observations to be made about the Phillies' play in Clearwater that will be applicable this summer at Citizens Bank Park. Luckily, they'll be serving the hard stuff there this season, because fans may need it. Hell, even the announcers may need it. I'm looking at you, Ben Davis. 1. If the Phillies are going to trade Cole Hamels, they need to do it now. If there's one thing you hope Ruben Amaro learned this spring, it's Murphy's Law. When starting pitcher Cliff Lee went down with an elbow injury, the same one that caused him to miss significant time in 2014, it served as a warning: pitchers get hurt all the time. Lee may have a few years -- and a few more injuries in his past -- on Cole Hamels, but if Amaro wants to move the team's most-tradeable asset, he'd be wise to do it now, even if he doesn't get the haul of top prospects he reportedly desires. The last thing this team needs, as it attempts to finally rebuild, is to be hampered by another contract they can't unload because the player suffered an injury (like Ryan Howard). Furthermore, for every start Hamels makes with the Phillies, he becomes less valuable to other teams and general managers, like a car that's still being driven as the owner tries to sell it. Trade Hamels, and do it quickly. There's no way it could be worse than the Cliff Lee trade. Out of minor league options, the Phillies outrighted Phillippe Aumont on Thursday. He was one of the prospects the Phillies got back in the deal that sent Cliff Lee to the Mariners, along with Tyson Gillies and J.C. Ramirez. Aumont, who cleared waivers* after being outrighted, was sent to triple-A to work on his consistency. He's the lone player from that deal still in the Phillies organization, as Gillies is in San Diego and Ramirez is in Arizona. *That's never a good thing when it happens to a young, inexpensive player. The Phillies' most loyal fans will tell you it worked out just fine, because the team eventually signed Lee as a free agent. However, it's that deal that is currently preventing them from dealing Lee (presumably in return for worse prospects, so maybe it's a blessing in disguise). 3. Phillies may have found another gem in the Rule 5 draft. Odubel Herrera will start in center field for the Phillies on Opening Day. He hit .355 in 62 at-bats this spring with a pair of home runs. He was selected in the Rule 5 draft from the Texas Rangers. That's the same way the Phillies acquired future all star and key contributor to their 2008 World Series team, Shane Victorino, whom they plucked from the Dodgers in the 2004 Rule 5 draft. Considering the fact the team likes Herrera enough to move Ben Revere from his normal starting spot in center field over to left in order to make room for the 24-year-old Venezuelan, it's a pretty safe bet that he stays on the 25-man roster the entire season. 4. Chase Utley is like a fine wine ... or Benjamin Button. The spring didn't get off to a great start for the Phillies second baseman, who missed the first few weeks with a lingering ankle injury, which lead to a collective groan from fans who are becoming all too familiar with seeing Utley sidelined. But then he returned, first as a DH and eventually at second base, and ... are we even sure that's Utley out there? Hair? Check. Emotionless face? Check. Swooning ladies? Check. I guess it is him. Utley may have only gotten 31 at-bats in his 12 games, be he certainly made them count, hitting .419 (1.357 OPS) with four home runs, two doubles, and nine RBI. If the 36-year-old is indeed poised for a comeback season, it's unfortunate that it'll be wasted as his team struggles to get out of the basement of the National League. 5. The Phillies are still going to struggle offensively. Despite impressive starts from Utley and Herrera, the Phillies were still one of the worst offenses in baseball this spring. That probably doesn't come as a surprise to most, because let's face it, no one in his right mind has high hopes for this team. And for proof of just how bad it may be at times, look no further than the player formerly known as "The Big Piece." 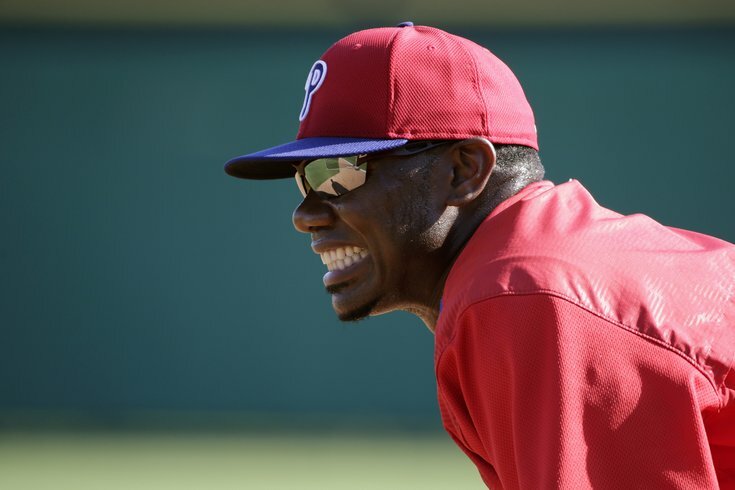 Ryan Howard, who surprisingly led the team with 70 Grapefruit League at-bats, struck out 22 times this spring, also a team high, and posted a lower OPS (.559) than Freddy Galvis (.721). His contract makes him untradeable, but his numbers make him outright undesirable. He'll make $25 million this year. 6. They're going to struggle defensively too. In addition to their offensive struggles, the Phillies are going to have a hard time preventing opponents from scoring this season. After Cole Hamels, Ken Giles and Jonathan Papelbon, the team has a lot of question marks on the staff. There are guys who have proven themselves before, like Aaron Harang and Chad Billingsley, but neither is a lock to have a good season, especially Billingsley, who is coming off an injury. Then there are guys who have shown flashes, like Jake Diekmann, David Buchanan and Justin De Fratus, but they're still young. So while the team was tied for second-worst in terms of runs scored, they were also second-worst in terms of runs allowed, averaging 5.75 per game. Their run differential of minus-55 was the worst in all of baseball. In the NL, the Braves were second at minus-38. 7. Domonic Brown isn’t likely to have that bounce-back year we hoped. Brown, who was slated to start the season in right field after spending the last two in left, will instead start the season on the disabled list with Achilles' tendinitis. After a career year in 2013, one that finally had Phillies fans believe Brown could finally be the coveted prospect he once was, the 27-year-old took quite a step back in 2014, hitting just .235 with 10 home runs in 144 games. The year before, when he was named to his first all-star game, Brown was fourth in the National League with 27 home runs to go with his .272 average. Before being injured, Brown hadn't offered much hope for a return to his 2013 form, hitting just .241 with one double in 11 games. Now, considering how tricky Achilles injuries can be and the fact that he won't be healthy when the season starts, whatever slim chances fans had of seeing a better Domonic Brown in 2015 have essentially evaporated. 8. They need to be careful with Ken Giles. Luckily, it appears the back injury Giles suffered earlier this week is minor and not worth getting too upset about. That being said, the team needs to be careful not to over-work their young set-up man. He's likely the closer of the future, and the last thing they need is to lose one of their best young arms to injury. Also, if the Phillies have any luck in their efforts to trade closer Jonathan Papelbon, they're going to want to shift Giles to the closer role immediately, something that will be impossible if he's on the disabled list. That way, he can work out any kinks -- hopefully there won't be many -- this season, when the team will likely be out of contention by the all-star break, rather than next year or the year after, when the games may actually start to mean something again. 9. Aaron Nola is going to be really good. Before you start screaming about sample size, you need to realize that Nola's three-scoreless innings against the Yankees were not an aberration. There's a reason the Phillies picked him seventh-overall in last year's draft. There's a reason he went almost immediately to double-A Reading. And there's a reason he was given a start this spring. He's really good. And his changeup is nasty. He may be a few years away from cracking the Phillies' rotation, but considering its current form, it may be sooner than that. If he is able to replicate the success he had last year in Reading, there's a good chance you'll see him at Citizens Bank Park in September. 10. Don't worry, the Phillies have your back. Because they know a team projected to finish last in baseball is hardly enough to fill the blue seats at Citizens Bank Park, they recently announced they'll sell hard liquor and wine during games this season, allowing fans to drink away their problems.